The Digital Knight DK20S is our 'flagship' 16x20 swing-away heat transfer press. The DK20S combines a heavy-duty solid steel industrial grade pressing framework with accurate and easy to use electronics to provide the operator with the best possible features and equipment needed for today's various heat transfer applications. This press is the most popular 16x20 machine in the industry. It is world-renowned as the top-end, robust-workhorse of all swing away heat presses. There is also a Jumbo sized 20x25 heat platen version of this press, the DK25S. An air-operated automatic version is also available: the DK20SP. Bottom Heat Platen Available - Select in Shopping Cart! Bottom heat platens are ideal for double-sided products such as car flags, bag tags, holiday ornaments, lanyard badges, etc. Because each platen utilizes fully independent digital control boxes and Geo Knight® SuperCoil-Microwinding™ heater technology, the presses can be easily adjusted to also provide traditional top-only heat or bottom-only heat when needed. The Digital DK20S is a 16x20 swing-away heat press with a state-of-the-art control system and heavy-duty solid steel welded framework. This machine boasts a lifetime warranty on the heat platen, and an unprecedented 3-year warranty on the heat-control electronics. 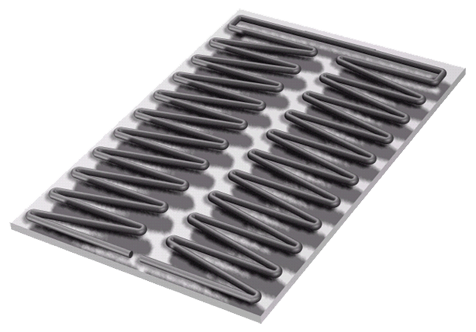 The heat platen uses SuperCoil-Microwinding heater technology, a system of embedded heater windings that wind tightly and closely together throughout the entire platen for extremely even heat, fast recovery & fast heat up times. The controller utilizes an easy to read oversized-digit LCD display to show time and temperature simultaneously, and the temperature readout is accurate within +-2°. The controller also features a digital height/pressure gauge for displaying current height settings. The operator can use the 70 programmable presets for saving common application settings of Temp/ Time/Pressure, ensuring consistent, repeatable results for all applications. The press is adjustable to accommodate materials from fabric thickness all the way up to 1" thick substrates! The DK20S combines a heavy-duty solid steel industrial grade pressing framework with accurate and easy to use electronics to provide the operator with the best possible features and equipment needed for today's various heat transfer applications. Includes FREE Lifetime Technical Support! At the heart of these machines is a state-of-the-art digital microprocessor control and proprietary heat control circuit field tested beyond 10 million heating cycles. This allows for an unprecedented 3 year warranty on the control. The Digital Knight controller features an oversized LCD display for easy reading of time, temperature, and pressure/height gauge readings. Overall, the extremely accurate control and intuitively easy to use interface makes for a reject-free production environment. The heaters on all platens of the Digital Knight line use an exclusive coil winding technology for dramatically superior evenness and speed of heating. Compared to traditional heating methods, the Geo Knight & Co. SuperCoil-Microwinding™ heater technology out-performs everything else. Of course, all Geo Knight & Co. heat platens are lifetime warranted. Would You Like A Stand w/Casters For This Heat Press? 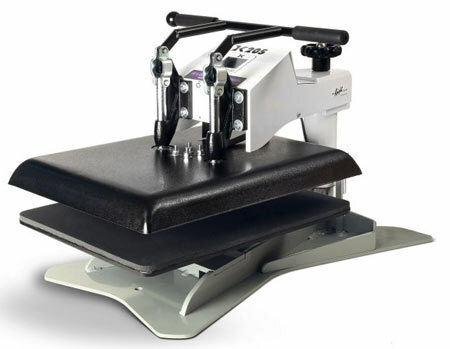 Increase production with a shuttle attachment for this heat press! Click Here For Platen Attachments, Stands, Shuttle Tables, Etc.